FAQ: How the heck do we move to a big kid bed from a crib? One of the most common questions I get asked about toddler’s sleep is when should we (or can we) move to a big kid bed and how the heck do we do it , so I’ve hooked you up with ALL the details below! When — AKA Is now the right time?! 4) your toddler is unsafely getting out of the crib on their own. If you’ve answered YES to these questions, then read on! If you’ve answered NO to these questions, then PLEASE WAIT! Trust me when I say I’ve worked with LOTS of toddler families and no one has ever said “Dang, Brittney, I really wish we would have transitioned into a big kid bed earlier”. This is my 2.25 year old Lincoln. We will be waiting AS LONG AS POSSIBLE before we make the move to a big kid bed because of what I know about the transition! How — Now is the time to move to a big kid bed, so how do we mentally prepare?! To start, you’re going to want to fill your little one in on what’s happening. Explain to them that they’re going to be making the move into a new big kid bed, set a date, and let them know when the switch is going to happen. When you explain what’s happening to your toddler, make sure you do it with a positive spin! Be aware that there’s a bit of tight-wire act to be performed here. On the one hand, you want to prepare your toddler for the switch, but at the same time, you don’t want to make a huge production out of it. Turning the whole thing into a monumental occasion puts a lot of pressure on your child and is likely to stress them out a bit. How — Now is the time to move to a big kid bed, so how do we physically prepare?! Here come’s the fun part… You are ready to actually make the trip to Ikea and pick out the hardware, just be sure to bring your toddler along. Giving your child some input into which bed they want, what sheets they like, and what pillow feels the most comfortable will ensure that they get something they likes, AND it will help them feel a sense of ownership over their new bed. This can work wonders in easing the big kid transition. If you have other questions about your toddler’s sleep, join me TODAY for a FREE “Nap Chat: Toddler Sleep Tips and Tricks” right here on Facebook at 1 pm Pacific! 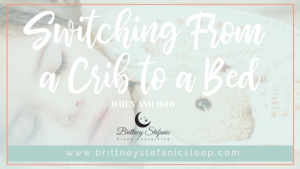 How — Let’s do it… Making the swap out of the crib! So now that the selected bed has been assembled and the sheets are on, you’ll want to setup the bed in the same place the crib used to be. In fact, you’ll want to keep just about everything exactly as it was in your toddler’s room except for the new bed. This is a big change, so try not to make any other unnecessary changes. This is very important for the schedule on the night of the big swap. When you’re getting your toddler ready for bed night 1, don’t alter the routine, don’t switch up bedtime, don’t try to give them a new food at dinner. Keep everything as predictable and mundane as possible. Toddlers are typically in a perpetual state of uncertainty about whether or not they want to do this whole “growing up” thing (think Peter Pan syndrome), so we want to keep things as low-key as we can. A) Your kiddo adapts immediately to their new bed and they don’t test the waters or break the rules whatsoever. B) Your little one seems to adapt immediately but, after a week or two, starts leaving their room, playing with their toys, or calling for mom to come back in several times a night. I call this the honeymoon phase scenario. C) Your toddler starts doing all of the things listed in B on the very first night. The solution to B&C is the same… Offer a warning when your toddler demonstrates the unwanted behavior, tell them what the consequence is going to be if they do it again, and then follow up on that consequence if and when they repeat it. Chances are that you’ve already discovered a consequence that works with your toddler, and I strongly suggest you keep that in place. Again, we don’t want anything to change except for the bed, so keep doing whatever you’ve been doing up until now in regards to managing behavior. And in case you haven’t discovered an effective consequence yet, I find that taking the lovie/blanket away for a short period of time or closing the door all the way are both pretty functional without putting your toddler into hysterics. For each repeat offense, increase the length of time that the door stays closed or the lovie stays out of the bed. Wow… That’s a lot of info! Yup — you asked for it, mama! This transition will be the biggest one yet for your little one when it comes to sleep. Remember that 4 month sleep regression years ago? Don’t let it be like that. Take the tips from above and USE THEM. I am always available support your family in making sleep changes, and I would LOVE to create a customized sleep plan for YOUR family and help with the move to a big kid bed and out of the crib!